Below is my letter dated today, February 25, 2016, to the Texas AG, Secretary of State, and the Honorable Renee Oliveira regarding the fbi's unlawful and prejudicial interference with duties of the DA and the Brownsville Police Department . Enclosed as attachment is a copy of the record of admissions by DA and police as to their unlawful refusal to investigate offenses that I have outlined with high State officials over the past three months. Re: Open Records . Evidence of fraud by Brownsville, Texas Police Department (BPD) and Cover up by DA and DA investigator. 1)* On 1-15-16 DA Investigator George Delaunay confirms that he prejudicially contacted the fbi via email at ‘ryan.flint@ic.fbi.gov’ in reference to GERAL SOSBEE (SOSBEE). 1) The DA and his investigator, after contacting the fbi, prejudicially and unlawfully refused to allow me and my wife to meet with the DA investigator regarding the offense committed by Detective Adrian Posada. 2) a)The statement by Sergeant Martinez (in item number two above) is patently false in that Martinez never communicated with SOSBEE regarding the Posada failures; so, Martinez falsifies the record when he reports that Sosbee is ‘ very upset.’ Indeed, at no time did Martinez nor Posada make any effort to speak with SOSBEE about the crime that Posada refused to investigate. b) the statement by Posada that he is ‘ uncertain that an offense had been committed at all’ is an admission of Posada’s initial wrongful failure to accept a police report from SOSBEE and his wife. Posada’s creative report on the CCN service department is a transparent effort to cover up his wrongful actions. He impliedly threatened me and my wife (during the initial meeting in his office on or about 11-20-2015) when he stated that “filing a false police report is a crime’’. Posada also incredibly and with hostility stated to me, “take the medication.” Posada also asked my wife away from my hearing where she met me. Posada’s report on file now in the BPD is false. The record shows that Posada made no legitimate investigation of the case, that he paraded about in the Charlie Clark Nissan Dealership (CCN) with his handcuffs protruding, that he intimidated the service manager by asking leading questions as though Posada is an attorney cross examining an hostile witness, that Posada never spoke with the actual mechanic (Marco Gonzalez) whose written statement I provided to the AG and others; that Posada, in his visit to CCN, was intent on trashing my complaint of felony stalking and criminal vandalism of my car probably by fbi operatives; that Posada asked absurd questions of the service department at CCN by stating, “is it possible that a loose wire fell out”, that Posada and Martinez and Vasquez all covered up the unprofessional handling of my legitimate report; that Commander Paschal confirmed in his own inquiry that my report was correct and truthful; that the DA and his investigator, and the BPD officers mentioned herein, together with the very fbi hoodlums who commit a string of serious crimes against my person, slandered me and attempted to prevent any inquiry of the many offenses committed against me, my wife and my property over the past decade in Brownsville and Harlingen,Texas and elsewhere. Police reports are on file with BPD and Harlingen, Texas Police Department, on many crimes against me. I have asked all authorities to open a public integrity case against Posada and others and I have shown that the fbi interfered with this case, thereby prejudicing all police and the DA against me. All authorities including the State Bar Office of Chief Disciplinary Counsel refuse to address these issues in deference to the thugs of the fbi. I repeat my request for a public integrity case against the miscreants mentioned herein and I ask that the police records be corrected to include this information on police offenses as I have documented over the past three months. Commander Paschal also wrongly refused to order a supplement report to the false Posada report. 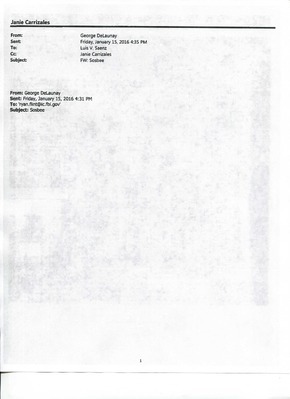 A copy of the Serrato report provided by Trista Valdez (reference above) is sent by US mail.